This chart reflects production of large incandescent lamps, which include the ordinary electric-light bulbs for residential, commercial, and industrial use. This category excludes miniature lamps such as those for motor vehicles, flashlights, and Christmas trees. (Bright, p.5, Note 2). Production of other types of lamps (miniatures, photofloods, etc) seem to’ve been fairly low in the first three decades of lamp production (1891-1919), but began to ramp up soon thereafter, certainly by 1939 (figures reported in Bright, p. 10), and by 1945 these other categories of lamps accounted for about 36% of total lamp production (calculated based on figures reported by the FTC in 1980, p.34). 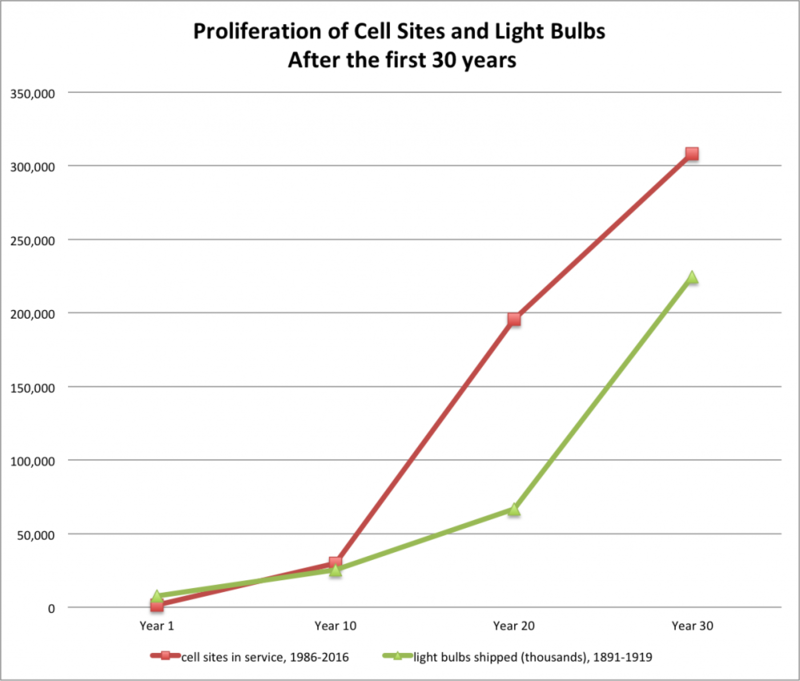 Data from these two sources is aggregated in CC’s Excel file: cell-sites-vs-light-bulbs.xls, which includes additional years of data (through 1945) for the light bulb industry, as well as calculated rates of growth. U.S. Department of Commerce,_c: Bureau of the Census, Current Industrial Report: Series MQ-36B(74)-5, Electric Lamps, 1975; and U.S. Department of Commerce, Bureau of the Census, Facts for Industry: Electric Lamps, 1946. Table 111-1 shows the U.S. value of shipments, exports, and imports in SIC 3641 for the years 1967 to 1973. During that time; imports never accounted for more than 6.79 percent of total domestic value of shipments while exports never accounted for more than 5.21 percent. When imports are added to value of shipments and exports subtracted from the whole, consumption can be found. Between 1967 and 1973, 93 percent of the total lamps consumed in the United States were manufactured in the U.S. In the same seven-year period, 94.8 percent of the lamps manufactured in the United States were used in the U.S. Chart shows historic penetration rates for new technologies – accelerating over time. And here’s an older version of the chart (1998), different illustrator, additional detail. And another version, through 2010, which really emphasizes the acceleration of penetration rates.